Google surpasses Apple as the go-to company for mobile ads. When smartphones first entered the marketplace, you had two realistic choices: Apple's iPhone or some other phone. The iOS platform dominated mobile markets for years following its original launch, but recently the tide has slowly turned as the competition learned from Apple and upgraded their own services accordingly. Now a new report is suggesting that Google's Android operating system has become the most popular platform for smartphone users and advertisers alike, with Android gaining a 46% global majority of ad impressions in Q2 2012. "Last quarter we confirmed industry trends showing how Android was experiencing considerable momentum, especially in North America," an Adfonic summary reads. 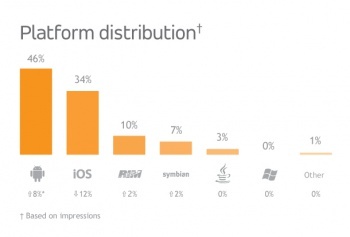 "In Q2 2012, we see that trend take on a global dimension: for the first time Adfonic's marketplace shows that Android's share of mobile ad impressions at a global level has overtaken iOS. Android increased its share from 38% in Q1 to 46% in Q2 while iOS lost share to Android, declining from 45% in Q1 to 34% in Q2." The report summarizes 4,000 monthly media campaigns run for brands like Samsung, Warner Bros., eBay, McDonald's, Groupon, and Google. Providing over 200 million unique users with 80 billion ad requests per month, these campaigns provide a good baseline for changes in the market. From the data at hand, we can see that the popularity of Android phones is on the rise worldwide. US markets in particular can't get enough of Google's mobile operating system, which grew from 46 to 63% over the course of three months. iOS advertising, on the other hand, is dropping across the board on iPhone and iPad devices alike. These figures certainly aren't set in stone. Adfonic adds that Apple is still in first place in terms of hardware devices, while TechCrunch's Ingrid Lunden believes that a new iPhone release could easily reverse the advertising figures. Nonetheless, this still marks the first time that the Android OS reached first place on Adfonic's global marketplace. Coupled with the public's reaction to the Ouya Android console, it's becoming increasingly clear that Google's operating system represents a force to be reckoned with.